Calpain is an intracellular Ca2+-dependent non-lysosomal cysteine protease expressed ubiquitously in mammals. 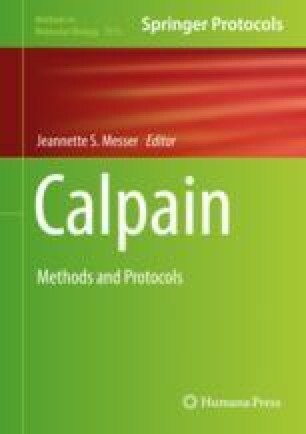 In endothelial cells, dysregulation of calpain has been shown to be involved in a wide variety of pathological conditions such as angiogenesis, vascular inflammation, and diabetes. Cell- or tissue-targeted in vivo delivery of small interfering RNA (siRNA) is a powerful research tool in the analysis of protein function and has been proposed as an attractive therapeutic modality that is applicable against a large number of human diseases including cancer. In this chapter we describe a method to knockdown calpain 1 in mouse pulmonary vascular endothelium using delivery of siRNA/cationic liposome complex. This technique results in a greater than 80% reduction in calpain 1 protein levels 48 h after a single i.v. injection of calpain 1 siRNA (0.5 mg siRNA/kg)/cationic liposome complex. We also describe confocal imaging to verify the loss of calpain 1 expression in pulmonary microvessel endothelial cells and application of this technique in the mouse model of ventilator-induced lung injury. This work was supported by the NIH Grant HL104092 to GH.